From jerky to a fast food burger at Wendy’s – what’s come over me? This is what sometimes happens when I’m out doing endless errands on the weekend and didn’t bring lunch with me. It was way past lunchtime and I had to have something and it had to be fast. I pulled into a Wendy’s drive thru, which was right where I was at the moment, thinking I could get a fish or chicken sandwich. 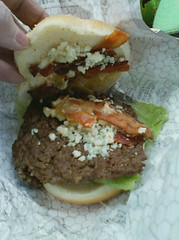 But I caved in once I saw this Bacon&Bleu cheese burger on the menu. It was quite good, and didn’t taste nearly as salty as I feared, although there was plenty of salt in it, as I later learned when I checked the nutrition profile online. That’s okay. I don’t do this often!